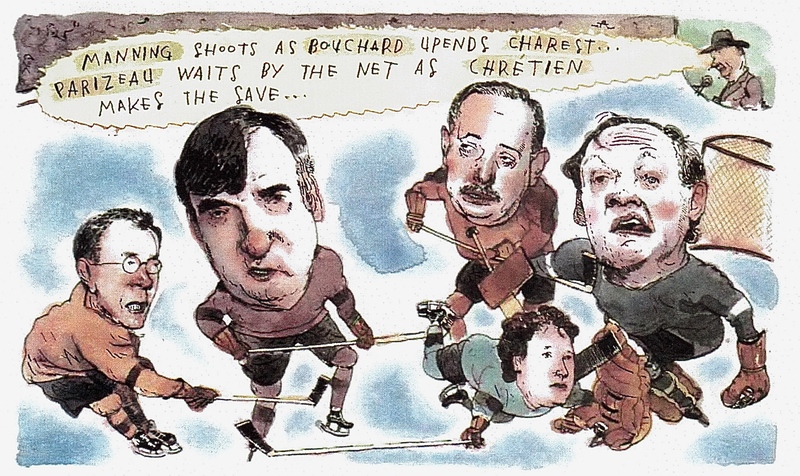 Barry Blitt’s illustration accompanied “O Quebec,” Mordecai Richler’s Letter From Canada published in the May 30, 1994 edition of The New Yorker. Politics and hockey share a season in Canada, and it’s one that fills the entire calendar year. Is it any surprise, then, that their respective languages mingle every now and again? 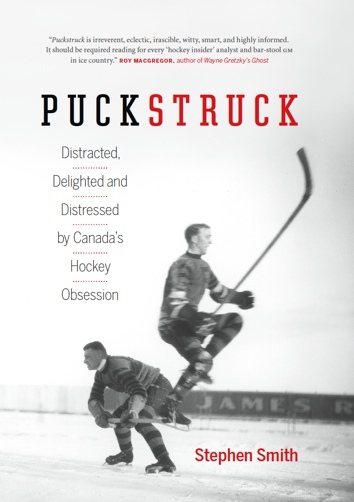 If recent history is a guide, politics tends to borrow more of hockey’s idioms than vice-versa. When was the last time you heard Winnipeg coach Paul Maurice praising his penalty-killers for filibustering Vancouver’s powerplay? Speaking of which: is Canucks’ GM Mike Gillis only proroguing the inevitable by not firing coach John Tortorella right now? Not that the politicians always get their metaphors exactly right. Actually I said I hope he won’t rag the puck. The Canadian government is asking Barack Obama not to “rag the puck” on a Keystone XL decision. But to hear the U.S. administration tell it, the president doesn’t have the puck on his stick, isn’t anywhere near it, and won’t commit to touching it soon. Nitpicking Minister Oliver’s comments from a strictly hockey point of view, if we’re going to do that, which we are, here’s the thing: it makes no sense to tell the other team what you don’t want them to do. Don’t rag the puck? You might as well ask them not to bother crossing the blue line and trying for a shot on net. If they’re ragging the puck, they’re doing it to baffle and deny you, throw you off your game, waste the time you need to beat them. That’s the whole point of puck-ragging. Assuming, of course, that Minister Oliver considers President Obama to be on the other team. I guess we should get that clarified for once and for all. If he thinks of him as a teammate, that’s a whole other problem. Unless he himself is the captain of team to the President’s rookie — Alex Ovechkin, say, lecturing Evgeny Kuznetsov. That would work, I guess. • Also in February: doing his best to explain changes regarding the role of the head of Elections Canada as laid out in the government’s proposed Fair Elections Act, Minister of State (Democratic Reform) Pierre Poilievre said that it was important that the referee of elections not wear a team jersey. Chief Electoral Officer Marc Mayrand was quick to respond: in his view, the bill would “take the referee off the ice,” and might even make it harder for some voters to cast their ballots.